Saturday, June 13 — 9:00-11:30 a.m.
FMR volunteers have done a great job removing invasive species and assisting with other restoration tasks at this lakefront site. Now it’s time to call in the professional fire crews to take it to the next level by performing a prescribed burn. Unfortunately, though, there are too many dead fallen trees and too much cut brush for the crew to work here safely. Come help FMR Senior Ecologist Karen Schik and staff from Washington County remove the deadwood and brush so we can take this important next step in this site’s restoration. No experience is required and all supplies, including pizza, will be provided. And, of course, park entry (normally $5) is free for participating volunteers. Learn more and sign up via the event page, or sign up now with Amy at akilgore@fmr.org or 651-222-2193 x31. Tuesday, June 16 — 6:00-7:30 p.m. Using a rain barrel is one of the simplest, high-impact ways to save water, save money and help protect our watershed. Join FMR and Coca-Cola to learn about watershed-friendly home and garden practices and build your own ready-to-install rain barrel. The $40 registration fee covers all supplies, including the barrel and conversion kit. 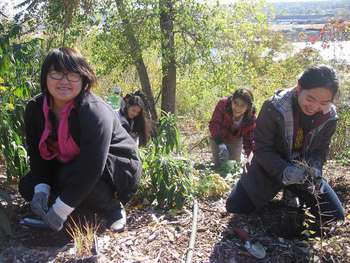 Thursday, June 25 — 6:00-8:00 p.m.
Help remove burdock and other invasive species from this iconic bluff-top park. Last year, volunteers installed native plants to anchor the soil, filter oil and other pollutants from water that runs down the bluff, and provide bee, butterfly and bird habitat. Now we need volunteers to work with FMR Stewardship Events Coordinator Adam Flett and staff from Saint Paul Parks & Recreation to help the young plants make it through the summer. 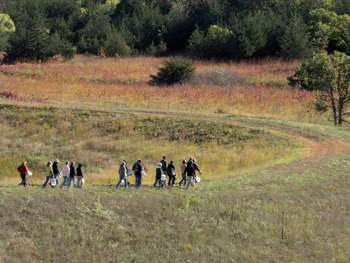 With less than 1 percent of Minnesota native prairie remaining, this highly protected preserve is no less than an oasis in a desert of wildlife habitat — 14 rare plant and animal species call the Coulee home. Plus, with its deep prairie root systems, the Coulee helps filter pollutants from runoff waters before they can enter the nearby Vermillion and Mississippi Rivers. Help protect it by removing invasive vetch and knapweed with FMR Restoration Ecologist Karen Schik and Registrar Amy Kilgore. 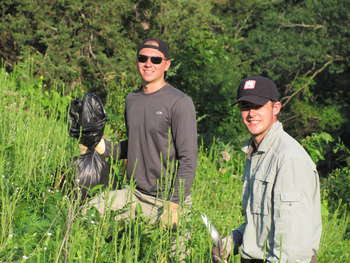 Thursday, July 9 — 6:00-8:00 p.m.
Help protect one the most beautiful areas in the Upper Mississippi River Basin, Pine Bend Bluffs Scientific & Natural Area. Volunteers will work with FMR staff to remove the invasive species spotted knapweed, helping to protect the native prairie plants that provide vital habitat for wildlife and help filter water pollution. Capacity is limited. Learn more and sign up via the event page, or sign up now with Amy at akilgore@fmr.org or 651-222-2193 x31. Thursday, July 23 — 6:00-8:00 p.m.
Grey Cloud Dunes is one of those places you can hardly believe is in a metro area. This highly protected Scientific and Natural Area (SNA) features two sandy terraces rising above the river, featuring dunes that crest 10 to 20 feet above the swales. 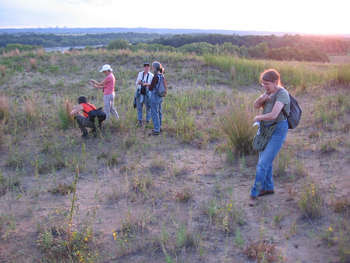 Join FMR ecologists in the rare dry prairie of the upper terrace. After a brief orientation, volunteers will help remove sumac, a shrubby tree that would otherwise overtake this vital bee, butterfly and wildlife habitat. Volunteers may also help remove trash, possibly near the parking area or riverfront, depending on where it’s accumulated. Due to tool usage, including loppers and saws, this event is not suitable for youth. Capacity is limited, in part to tread lightly on this special place but also to make sure everyone has a chance to ask questions about the site’s ecology and the many native plants and flowers sure to be in bloom on this summer evening. Learn more on the event page, or sign up now with Amy at akilgore@fmr.org or 651-222-2193 x31. If you’re looking for a great service outing that is educational, active, outdoors and provides a significant community benefit, consider storm drain stenciling. It’s just one and a half to three hours in length, and can be set at a time and St. Paul location convenient for your group. Reservations are now being taken for outings through October 2015. Learn more on the stenciling event page or go straight to our stenciling, cleanup and presentation request form!